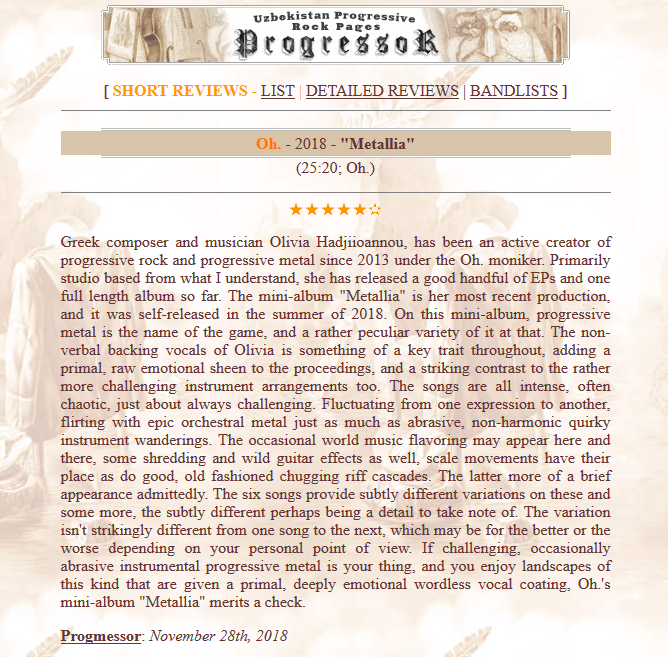 Review of Oh.’s “Metallia” by Olav Martin Bjørnsen on ProgressoR — Oh. On this mini-album, progressive metal is the name of the game, and a rather peculiar variety of it at that. The non-verbal backing vocals of Olivia is something of a key trait throughout, adding a primal, raw emotional sheen to the proceedings, and a striking contrast to the rather more challenging instrument arrangements too. The songs are all intense, often chaotic, just about always challenging. Fluctuating from one expression to another, flirting with epic orchestral metal just as much as abrasive, non-harmonic quirky instrument wanderings. 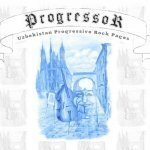 The website ProgressoR – Uzbekistan Progressive Rock Pages: an online progressive music review database was founded in 1998 by the late Vitaly Menshikov who was the editor until 2016. Since then editor Olav Martin Bjornsen (Progmessor) has taken over as the main reviewer on the site and Dmitriy Menshikov as the technical editor and webmaster. It was one of the first sites online that covered progressive rock, metal and avant-garde music with thousands of reviews and a detailed database that spread the news of the genre around the world. Since 2008, Olav Martin Bjornsen is the main reviewer on www.progressor.net delivering over 100 reviews a year for over a decade. He also reviews for the internet radio website houseofprog.com. 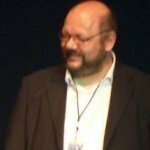 In the past, he was an active collaborator for the website www.progarchives.com as (Windhawk), wrote for Progressive Ears, Prog4You, and USAprogmusic. He writes for the Rites of Spring Festival (RosFest), FRaME music and is a radio DJ on the House of Prog. 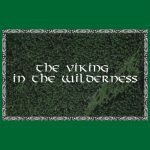 The Viking in the Wilderness is a weekly 3 hour long internet radio show that started in 2017. The host is Olav Martin Bjørnsen. Featuring a variety of music from jazz to progressive rock, ambient sounds, heavy metal and music beyond definition. Note: I am very grateful to Olav “Windhawk” who first discovered my music on House of Prog and added it to Progarchives in 2013.